We are disintegrating. Our bodies as fast as our minds. Can’t you feel it? (SPOILERS) It seems I’m forever destined to miss what others find so remarkable about Alex Garland’s work (I was also the one who didn’t love Ex Machina). Annihilation left me mostly cold while most appear to have done little else but rave about it. Tarkovsky’s Stalker has been invoked, but they’re chalk and cheese, one meditative and elusive, the other transparent and over-didactic. I will say this for the writer-director-auteur, though: he’s finally made a movie where the third act is superior to the preceding portion, even if this time it’s qualitatively inverted. And, he still can’t escape his Apocalypse Now obsession. The success or otherwise of Annihilation for you will likely come down to whether your find the groundwork for Garland’s ultimate trip provocative and his characters stimulating. Unfortunately, the latter are mostly paper thin, rudimentary types – “all damaged goods” – fostered reductive issues so as to explain away their fates. Those fates – of Anya (Gina Rodriguez), Cass (Tuva Novtny) and Josie (Tessa Thompson) – vary in method and intensity, the properties of The Shimmer operating as a variant on The Empire Strikes Back’s “You only meet what you bring in with you” Jungian tree, only with a whole lot more on-the-nose exposition courtesy of Bendict Wong’s scientist throwing us out of what might been a more immersive experience with join-the-dots questions every five minutes; Lena (Natalie Portman) even helpfully wraps their demises in a “I had to come back. I’m not sure any of them did” bow. Ventress: A religious event. An ET event. A higher dimension. We have many theories and few facts. There are subtler touches in here that might have worked in a more nebulous movie – the Ouroboros tattoo that lends itself to various arms of those entering the Shimmer, the bear one on Kane’s (Oscar Isaac) chest, suggestive of the creature that at one point is belowing Cass’ alarming scream (again, helpfully explained, this time by Jennifer Jason Leigh’s Ventress – “I think as she was dying part of her mind joined part of the creature that was killing her” – so no room for ambiguity there) and that the house they arrive at is a representation of Lena’s. But then, it’s been laid out on a plate that this force is instinctively replicating the architecture of visitors’ minds. Lena explains to Lomax “I don’t think it wanted anything… It mirrored me. I attacked it. I’m not sure it even knew I was there… It wasn’t destroying. It was changing everything. It was making something new”. The only ambiguity here is the personal ending between Kane (Garland with his homaging again, this time to Alien, where the namesake character is also irrevocably changed by an ET force) and Lena (“You aren’t Kane… are you?”: “I don’t think so”). Itself a more intimate version of the ending of John Carpenter’s The Thing, in which the exact nature of who has survived and in what state is left undefined (apparently, in an earlier draft of the screenplay, it’s clear that Lena’s copy blew herself up, which is as it would appear here, but it’s at least a shade more interesting if it’s possible that both are copies; instead, the implication is that she has been altered by the Shimmer, whereas he has been entirely replaced. Either way, with the “overtly” established Shimmer miraculously destroyed, Kane and Lena will presumably take on the business of engulfing the planet by stealth). 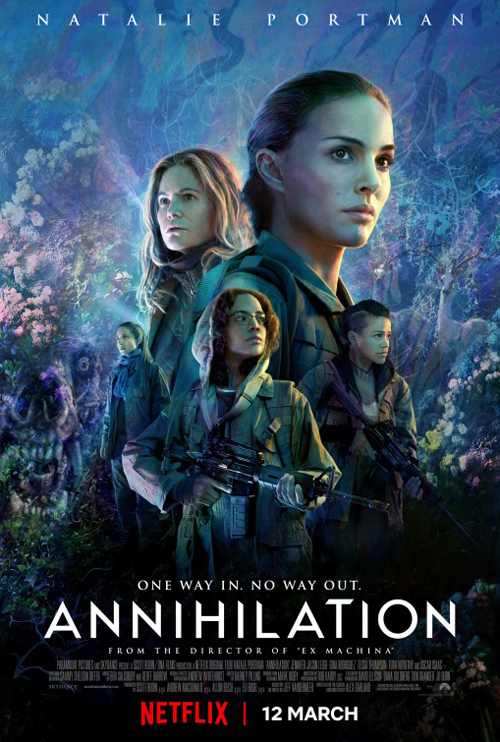 Like The Thing, Annihilation is an end of the world movie (“I don’t know what it wants. Or if it wants. But it will grow until it encompasses everything”) but unlike that film, a remake that entirely has its own identity, Garland gets bogged down in his references. How else to explain an earlier scene in which three of the scientists are tied to a chair while the paranoid other presides over them, a scene that culminates in a monstrous other intruding on the quartet? Or the mutations and self-immolations suggestive of Event Horizon (in particular, the video footage)? Or the theme of memory and love lost (Solaris overlaid onto Garland’s Stalker template)? And that, yes, Kane is essentially Kurtz, with Lena his Willard heading up the river/Shimmer to find what became of him. And being Garland, Annihilation is much more visceral than cerebral – look at how he ended Sunshine, for goodness’ sake - while Tarkovsky lingered between the spaces of his characters, Garland delivers leaden exposition and rote dialogue amid a first hour that’s all-too familiar gun-toting mission dynamics (of which, Lena proves to be super-capable in a kind of Arnie-commissioned-rewrite way; she’s a scientist who was also formerly in the military), with little beyond the production design to really mark it out as something different. Kane: God doesn’t make mistakes. It’s somewhat key to the whole being a god thing. Lena: I’m pretty sure he does. Kane: You know he’s listening right now? The problem I have with Garland is his aspiration towards being something more than that, which always outreaches his grasp, exposing him as ill-equipped. 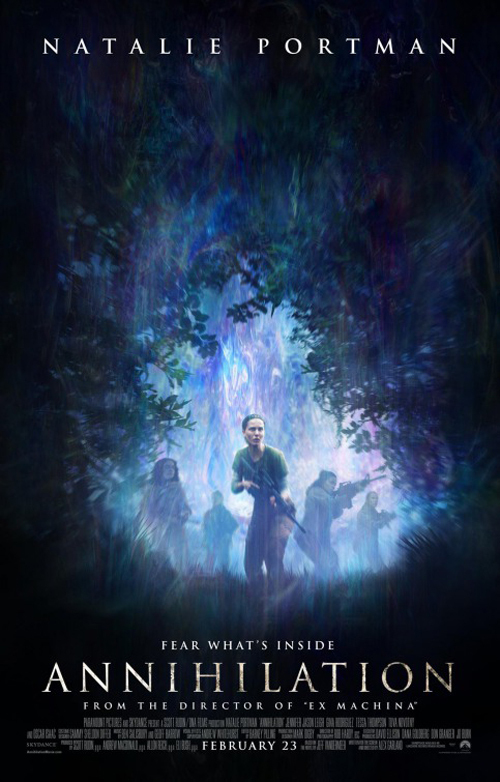 Annihilation is pseudo-intellectual, vaguely philosophical and not really especially deep or penetrating; as with his earlier work, it bears the demeanour of the student philosopher, one who has arrived where he is through taking some really cool drugs, man: a mind that sees hallucinogens as the ultimate gateway. Which is obviously why he ends with a 2001 trip experience in the final reel. Which I liked much more than the preceding material, but even here, the inability to resist vocalising Annihilation’s themes punctures its potential (Garland even lays out his stall in interviews, breaking the premise down to “how hard it is to be a person”, which as profundities go, isn’t exactly breaking new ground). There’s some striking imagery throughout the picture, but there’s also much that is rather over-telegraphed and heavy-handed, most notably the glass that refracts the conjoining fingers of Lena and Kane in an early scene (“The Shimmer is a prism but it refracts everything – animal DNA, plant DNA, all DNA”). In the final reel, at least, there’s a greater uniformity of approach, even given the variable quality of the CGI. In particular, the human topiaries and the dance of Lena’s mirror self as the former comes to realise what is occurring. There are also some cute moments such as the mutating manner in which the “infection” is passed on from person to person, or Kane instructing his double to find Lena (kind of cool, but in a very, very Garland “cool reveal” way). Under the Skin sprang to mind on several occasions, but as a less complimentary reference; Jonathan Glazer is entirely comfortable leaving meaning unspoken or unresolved. Garland, even when he’s looking for an open ending, wraps everything up. Still, Annihilation appears to have done its job of cementing Garland’s rep as a fiercely cerebral writer. And unlike The Cloverfield Paradox, its warm reception will likely do him the power of good through all that Netflix exposure. For me, I find myself ironically in the position of preferring Garland’s earlier, more juvenile experiments, flawed as they are (28 Days Later, Sunshine) than this self-conscious and under-nourished mature phase. Age isn’t a disease. It’s a natural progression. Sharks don’t take things personally, Mr Brody. I never said you were a superhero. Tonight, you will kill America's President. We find that monster, we find Skinner. You've still got some shoot in your boot. BICYCLE? You'll die with blasphemy on your lips!